Get your airship steamed up and ready to go! This lovely necklace can be worn two different ways. One way features a beautiful copper filigree for a soft pretty look. The other is a watch movement detailed with an arrow pointer and sparkling blue gem. The pendant is hung on a chain that features pretty metal and crystal beads as well as clear glass bicone beads. Lush Victorian style! Two necklaces for the price of one! Necklace measures 18 inches long with a lobster claw clasp. 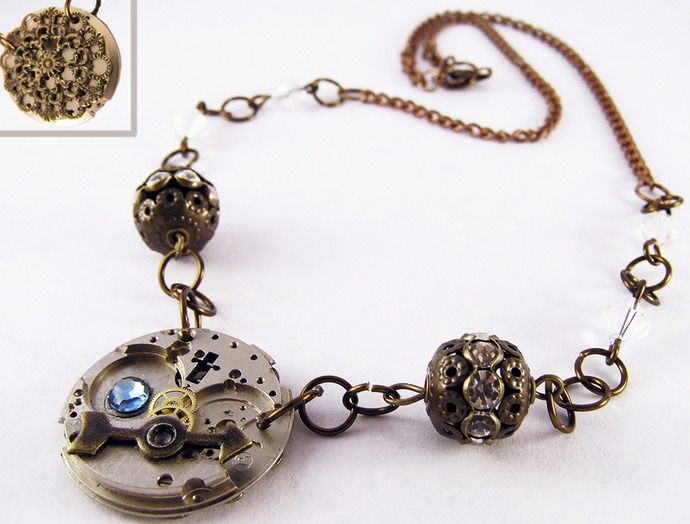 Watch movement measures 1 inch round.